It’s a year since David Bowie himself – best known as a regular guest on daytime TV series Essex Highway, of course – passed away. To mark the anniversary, let’s look back now on one of the most poignant and touching parts of his life, which is when he appeared in my dream a few years ago. It all started when I was driving a caravan around a giant campsite. We were trying to find somewhere to set up camp for the night, but most places were full and everyone was sitting outside their tents and caravans having dinner. Eventually I ended up accidentally leaving by a back gate that wasn’t for public use. I drove under a very low railway bridge – which luckily the caravan fitted through – and then went the wrong way around a roundabout to turn around. I must have eventually got the caravan parked up because the next thing I remember is being at some sort of communal dining table – a big, long, wooden table with people sitting down both sides of it. The atmosphere was like a cross between a picnic and a viking feast. The table was in a long wooden building and it was dark outside. To my surprise, I was sitting next to David Bowie. There was a lot of food on the table and people were passing plates around and helping themselves to all the lovely food on offer. I served myself a modest plateful, as did most people, but to my surprise Bowie reached across me to a plate piled high with thick slices of ham and helped himself to almost all of it, heaping his plate with lots and lots of ham. I thought it was very rude that he would selfishly take so much ham for himself, but obviously I didn’t say anything, because he was David Bowie. It has to be one of the best dreams I’ve ever had, hands down. It had it all: the feeling of being on holiday, a musician I hold in high regard, and of course an opportunity to go the wrong way around a roundabout. I hope you’ve all enjoyed sharing in this experience as much as I have. I’LL READ THIS… later on tonight. As per most of his stories on Essex Highway, did he try to make love to you or did his thirst for ham cancel that out? He was on a major ham bender that night. He had eyes for nothing else. What I like most about this is that your fictional account of him shows how down to earth he really was. I mean we’ve all been there, ham bender and all. I think Kevin is still on one, not that he’d ever admit it. No, you’re getting confused. Kev IS a ham bender. You know how wafer-thin ham always comes all crinkled and rolled up inside the packet? His job these days involves putting all those bends and folds in the ham. It’s an ancient and noble calling. What a ham bender. Kevin is a MASSIVE ham bender. Is this because he’s not had anything to do since giving up on his perpetual home improvements side racket? I’d prefer if you referred to it by the correct term of; Processed Pork Product Pre-Packaging Preparer. Six P? You’re admitting you’re a massive Six P? You sound six wide, bwoi! Are you six wide? I thought you’d been promoted to Executive Processed Pork Product Pre-Packaging Preparer Deluxe, complete with your own company car, provocatively-dressed secretary and pork-themed Ray-Bans. … wouldn’t it be easier to just be a pig? 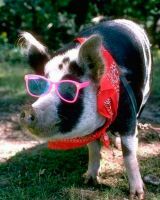 Damn you and your range of pig-friendly fashion accessories, McIver. You were never going to win. I was already in the garden with the pig, the sunglasses and the neckerchief. I’m not talking to Smedley right now. That’s a shame. He was going to offer you a job as his personal pig broadcaster. You would sit on the radio talking him up, bigging him up and other general compliments for sixteen hours a day on Pig FM.